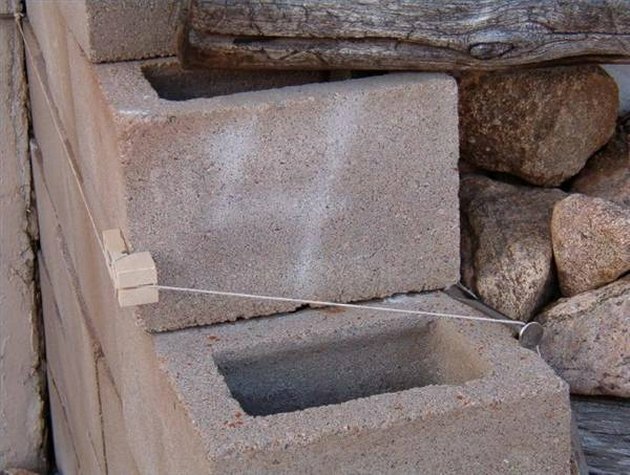 Cinder block can be a cost-effective material for building your next house. 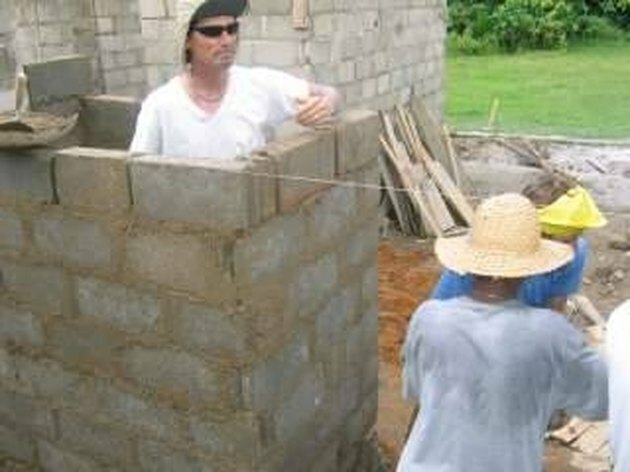 Not only are cinder block houses relatively simple and basic, they are also considered structurally sound and solid. In the following article, you will learn about the necessary steps in building a cinder block house. When the block companies deliver, they bring cubes of cinder block. 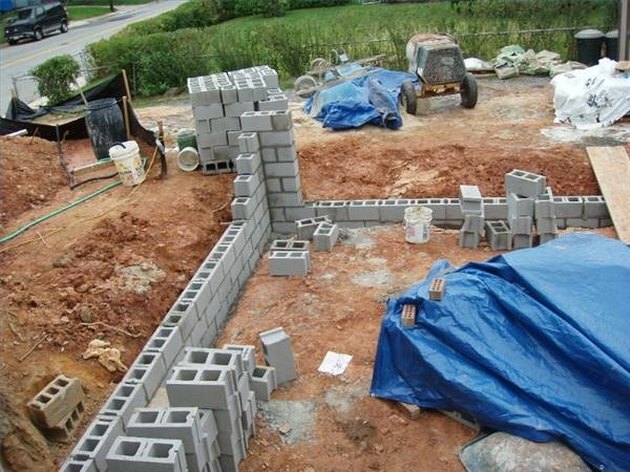 These cubes consist of 80 to 90 blocks that must be broken down into piles of 10 to 12 blocks and stacked about 2 feet away from the concrete footer on which the house will be built. Mix the mortar according to instructions on the bag, usually 16 shovels of sand per one half bag of mortar. Place two to three shovels of sand and then the half bag of mortar in the wheelbarrow. Mix the dry parts together with the mixing hoe and then add the rest of the sand. Once all the dry parts are mixed, slowly add water and mix until you have the consistency of cake mix. When the mortar is mixed and ready, place a few shovels onto a corner board. Make sure that there are four corners of reference to work from and that the walls are square relative to each other. You will build at least four corners up about five blocks high. 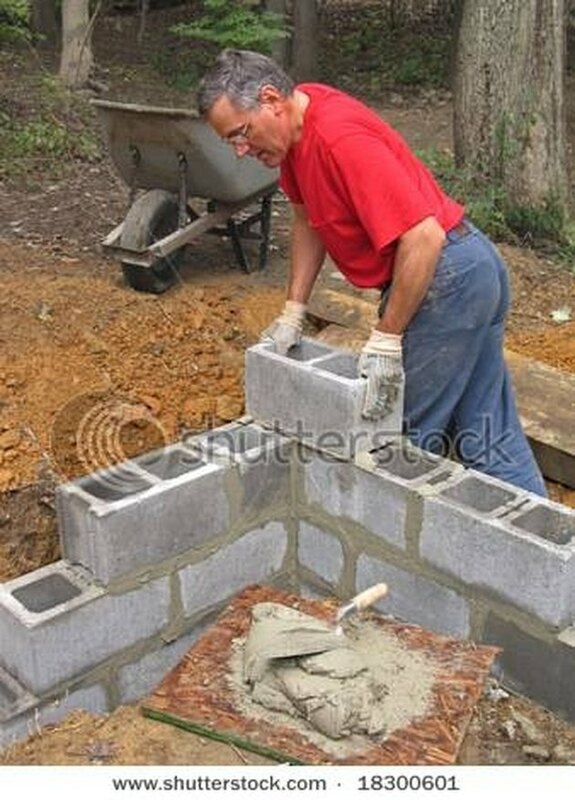 As shown in the picture, use the block trowel to spread the mortar mix in two thick lines about as wide as the cinder block and far enough out to lay three or four blocks long. Make a 90-degree corner. After the first row is down, stagger the next block to lay it halfway over the bottom block. 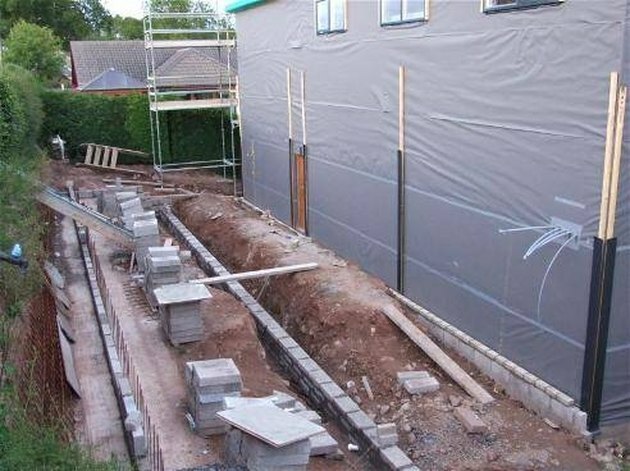 Level and plumb your corner walls so that they are perfectly straight, square and plumb. Use the thumb jointer to smooth the mud from between the block joints. Once the corner walls are up about five blocks, run the courses between. Using the line blocks, stretch the nylon twine and tie around the block. Place the blocks on the corners of the first row of blocks and begin filling in the first course. Continue until you have run the walls up to the desired height, usually 8 to 10 feet.